It's a motherboard, what else did you expect? 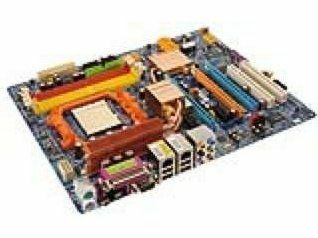 Gigabyte isn't shy of alliterative marketing spin and this 'S Series' motherboard serves up a succession of s's to sell its stuff: Silent-Pipe, SLI, Speed, Smart and Safe all find prominence on the box. Sound would have been an obvious one to add because it supports Dolby Digital as well as DTS, while Stable would have been a good watchword too: it didn't hiccup once during testing. Based around Nvidia's premium 590 SLI chipset, this board has various bells and whistles. Dual X16 PCI Express lanes when working in SLI mode form the core of the feature list, with support for automatic bus overclocking when using SLI memory (currently rare, but soon to hit the mainstream). Gigabyte has done a good job making sure that the introduction of large swathes of metal hasn't encroached onto the space of other components. All the more impressive due to three full-length PCI-Express slots present (an X8 slot is present in addition to the SLI connectors). There are eight SATA connectors, as well as Gigabyte's Dual BIOS chips, which can be revived from a backup stored on your hard drive as well. It's nice to see Gigabyte still setting the standard in the usability stakes. Its Xpress install is a straightforward drive setup (although the inclusion of the Yahoo! Toobar isn't welcome). Norton Internet Security 2006 is also on this disc, although the target market won't be too interested in such protection. AMD has followed Intel's lead and is supporting DDR2, up to the 800MHz frequency as offered by this motherboard. In testing, using a non top-of-the-range pair of sticks from Corsair, we witnessed an impressive throughput of 6,869MB/s, which highlights one area where AMD still has a notable lead over Intel's Core 2 Duo.